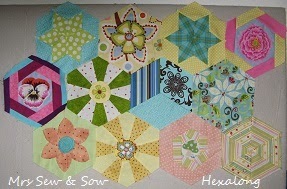 Ending up with this many hexies - I can barely fit them all in the photo! 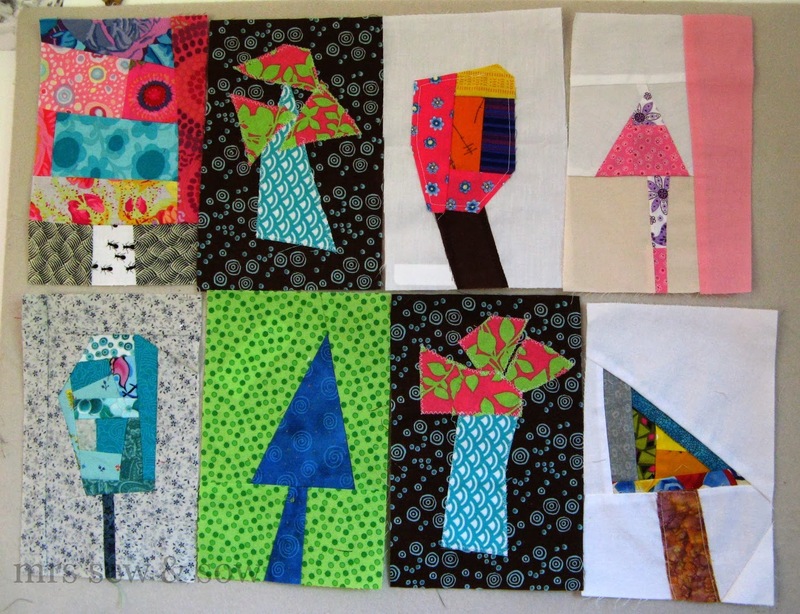 Oh dear since the electricity was re-connected I haven't made a single one! 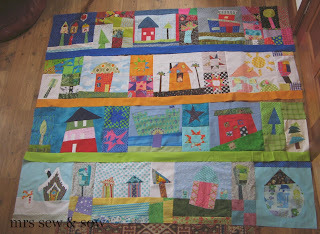 This could end up quite a big quilt if I don't get too distracted......and the one thing I have done since I've had power again is to join the fun on IG thanks to a Christmas present from my family and the best thing is that I have techy help at hand as my youngest has an iPad and knows how to use it. (This post was brought to you by IG and iPad ). 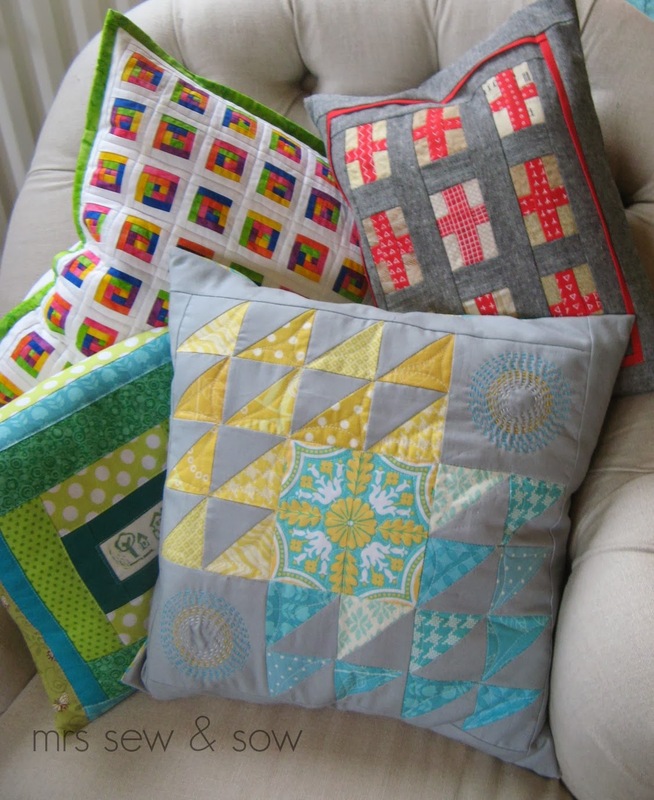 My IG handle is predictably nickyeglinton - had a great welcome thanks to the lovely quilty crowd! Not Dove tails! I don't do carpentry! 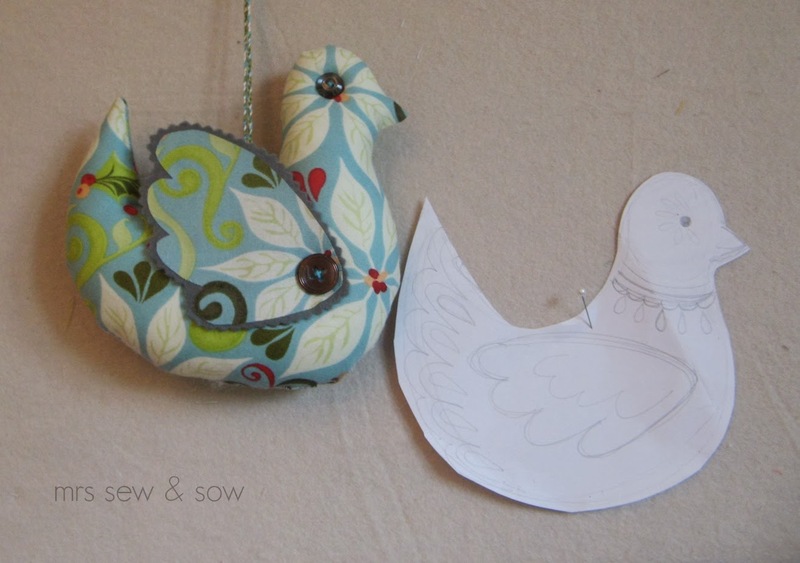 I wanted to make a Christmas Dove - symbol of peace and all that! The wings are fused onto felt which I have pinked and stitched on using a couple of old buttons, my longest needle, my thimble and a bit of grippy stuff to pull that needle through all that stuffing and back through going the other way. A bit of a return to my stitching roots really as when I started sewing I was making soft toys. 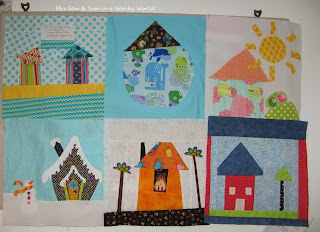 I was lucky enough to receive lots of lovely blocks from the Wonky House Swap group and decided I would make them into a picnic blanket. 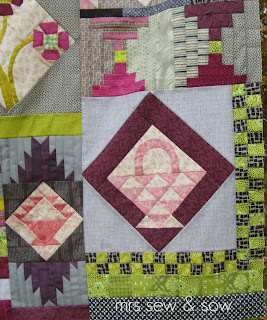 After conversation with the lovely Katy I went with cord as the backing. 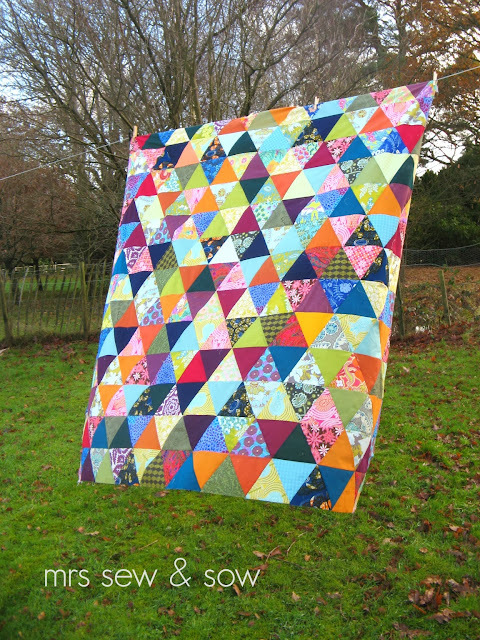 Having made that decision I thought I'd better Quilt as You Go or I'd have to wrestle a heavy quilt through my little machine! That all went reasonably well. Then I wanted to add borders and the quilt title in paper pieced letters created by Kirsty @ Quiet Play and called Just My Type. I got as far as one word before I gave up! Nothing wrong with the pattern - all to do with me and how I used to feel about paper piecing. Ok it is still not my favourite construction method - I still make too many mistakes meaning I have to unpick lots but I do love, love the results! 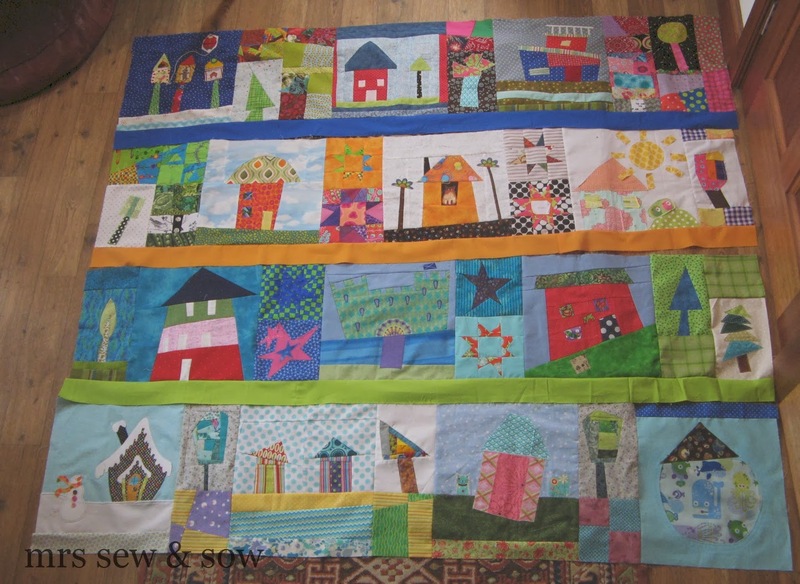 So I have at last got around to finishing the borders on this quilt, including some blocks that didn't fit into the central part of the quilt, my words and the siggy blocks! Just got to add wadding, backing and to quilt all those borders in this QAYG project and of course to bind it all! I have been waiting for an order to arrive. 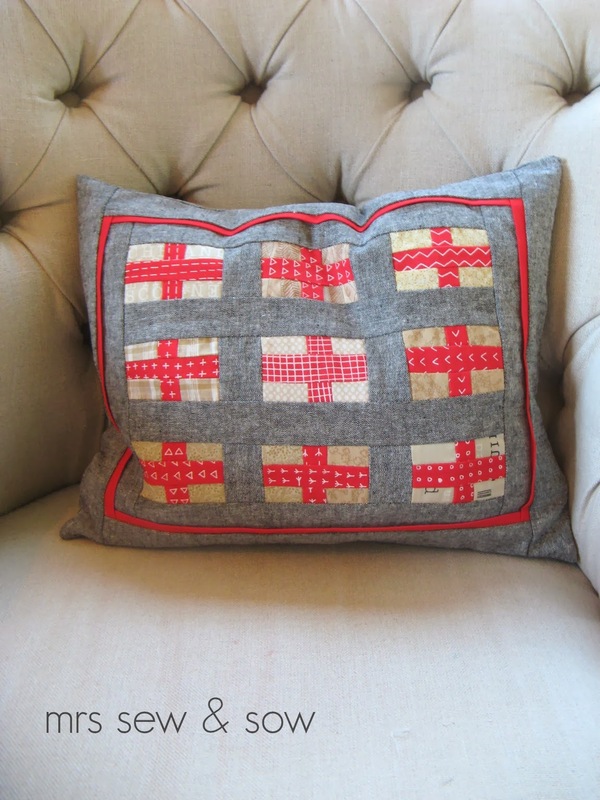 An order of Oakshott! 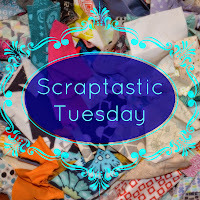 I needed some Seville, some Sea Lavender, some Palma, some Seville, and some Grape to go with the printed fabrics I was including in the two quilt tops I have been working on. I am thrilled with these gorgeous colours! 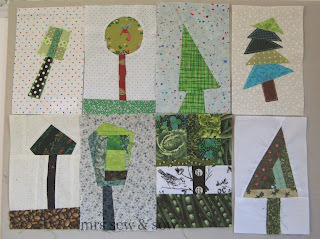 They have now been cut up a bit and have joined the melee in my two quilt tops! 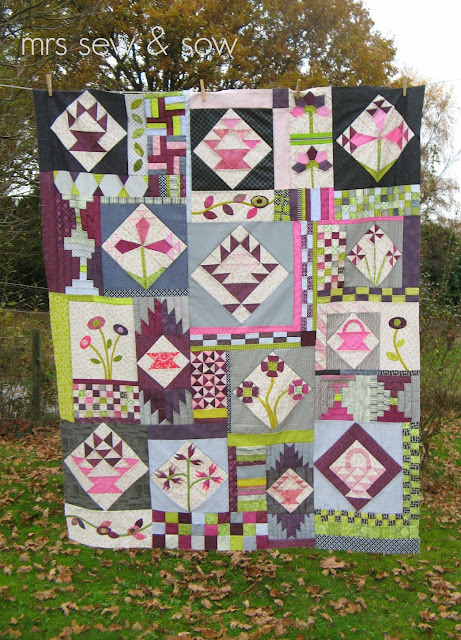 Here is one of them - finished - my Pyramid quilt inspired by Annabella's gorgeous Field Study one! 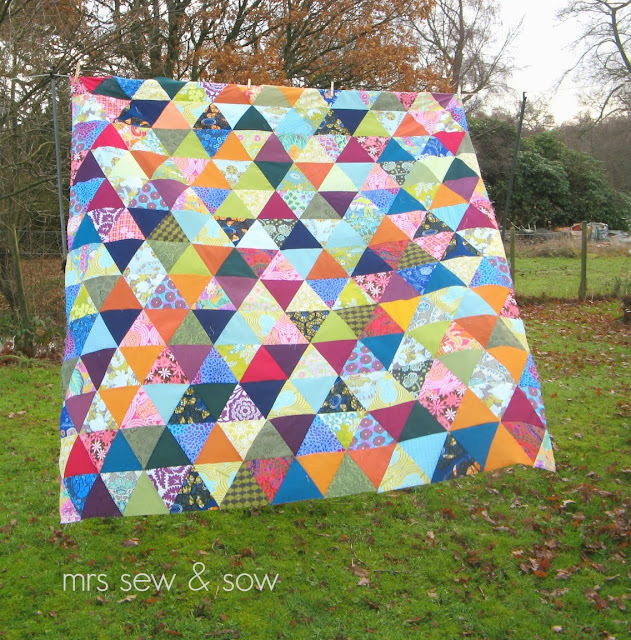 All the solids are Oakshott and they do lend a sparkle to my quilt, to anything really! 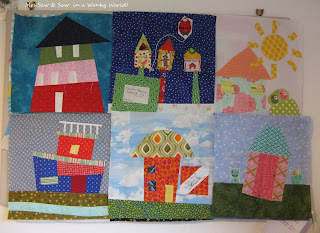 How I loved Annabella's quilt and how I love mine! 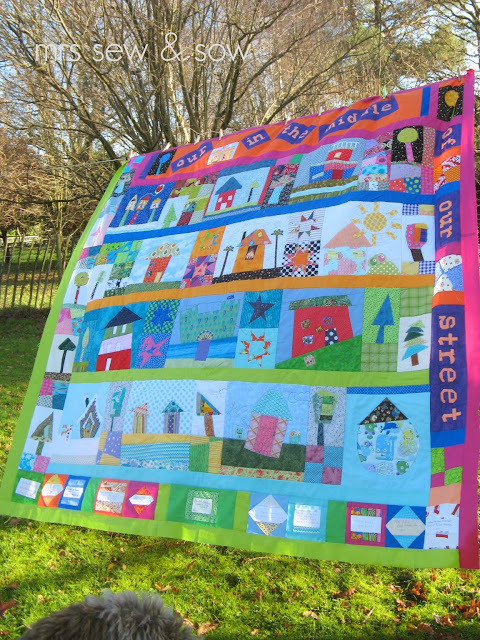 There is a bit of progress on the other one but you might have to wait a bit to see - batteries re-charging! 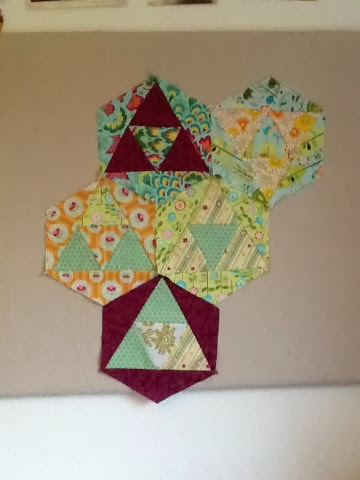 It was possibly going to be a bee quilt - this winged square block - but as I didn't pick it in the end I've decided it's a cushion! 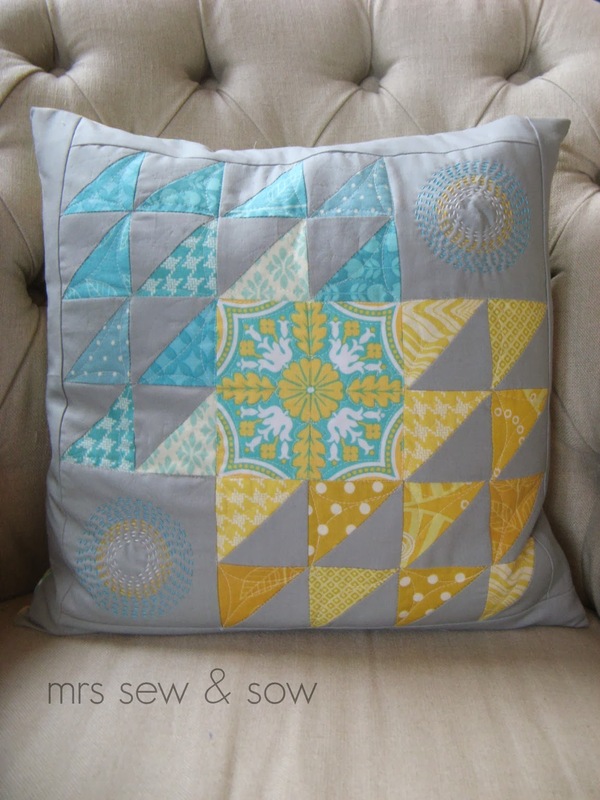 I have quilted it a bit and stitched Kantha style in the corners picking up the colours of the fabrics - aqua, yellow and white! Even less room to sit now! Edit : I should have mentioned that the idea of the two colours merging in the centre square came from Amy @ During Quiet Time - you can see her tutorial here. I may get to make the quilt someday! 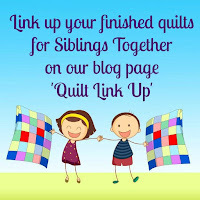 When you have a lot of quilts to make sometimes a quick project is what is needed. I bought some beautiful red allotments screen printed fabric from Karen at Blueberry Park. 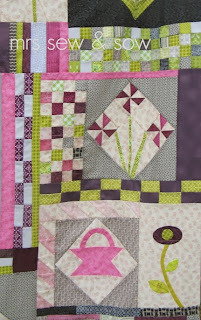 Almost immediately I started making little plus blocks with some tan LV background. They soon became a panel teamed with some yarn dyed Essex linen on black purchased from Simply Solids. 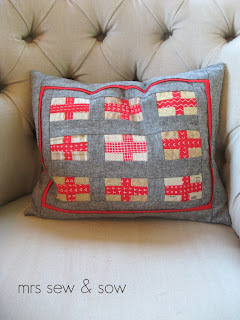 But only now have I got around to making my panel into a cushion - love it though! 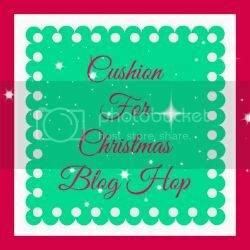 No room for sitting down now...but the good news is that it was on my FAL list! Yeah! 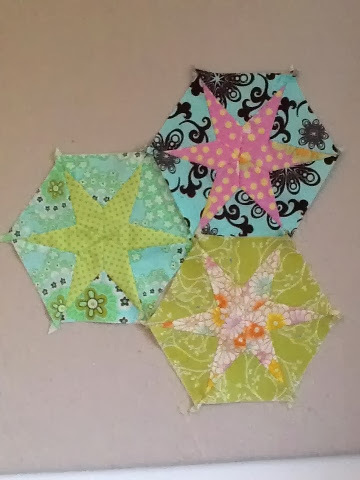 Someone suggested I should work on another quilt I started this year as I wait for some Oakshott to arrive to complete the other two I've been working on. So like the obedient person I am (not) I started by checking out how much I had to do to finish the quilt top in question. 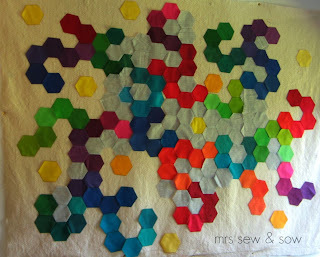 I then found myself cutting out some background hexies to fill in the gaps between my hexy balls and then irresistibly pieced those balls together. 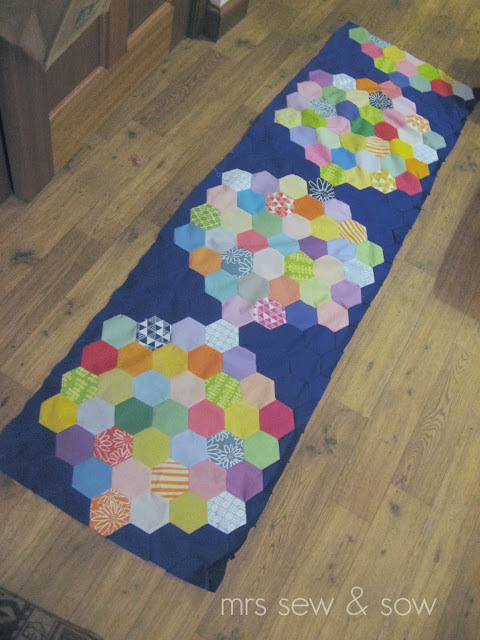 Next I got ready for the next phase - I cut the half hexies to straighten up the edges so I can add more background fabric. 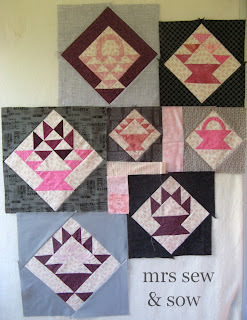 And I pieced them all in too. Guess there wasn't too much work to do after all! 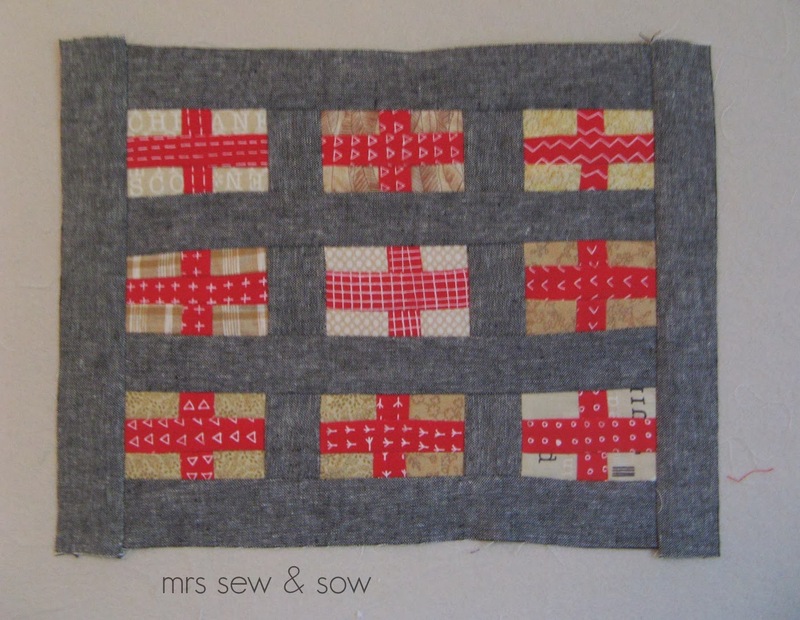 Think I'm beginning to like this one now all that fiddly boring bit has been done! 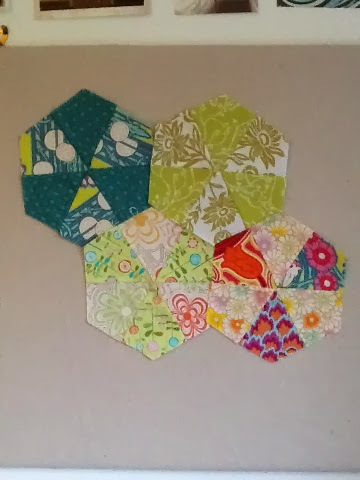 My hexy balls are made from some Kona honeycomb precuts and some of my hoarded stash of Blueberry Park fabrics - hand screen printed by my lovely friend Karen! 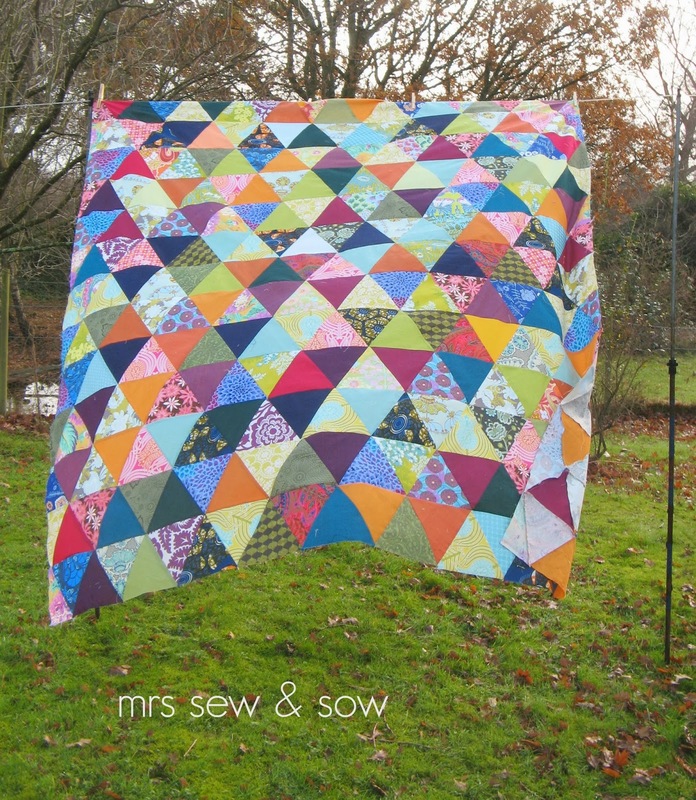 In case you are interested she is running a limited edition fabric club next year - fabric every two months in different colours and prints - go on, you know you want to! I did! 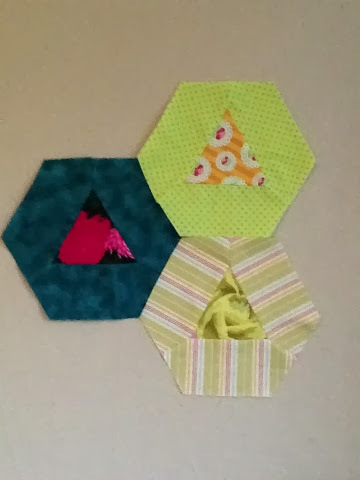 You know I have so many projects started I am now working on two at the same time! 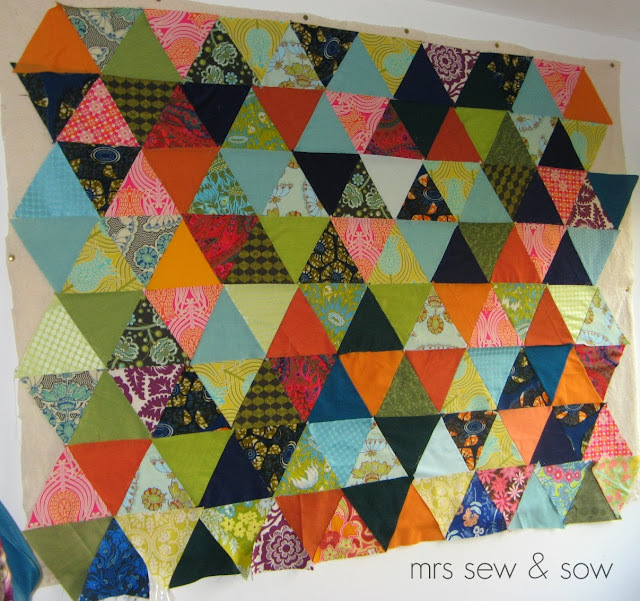 When mycelium came down from one design wall I put up a triangle project I started after seeing Annabella's glorious Field Study quilt! 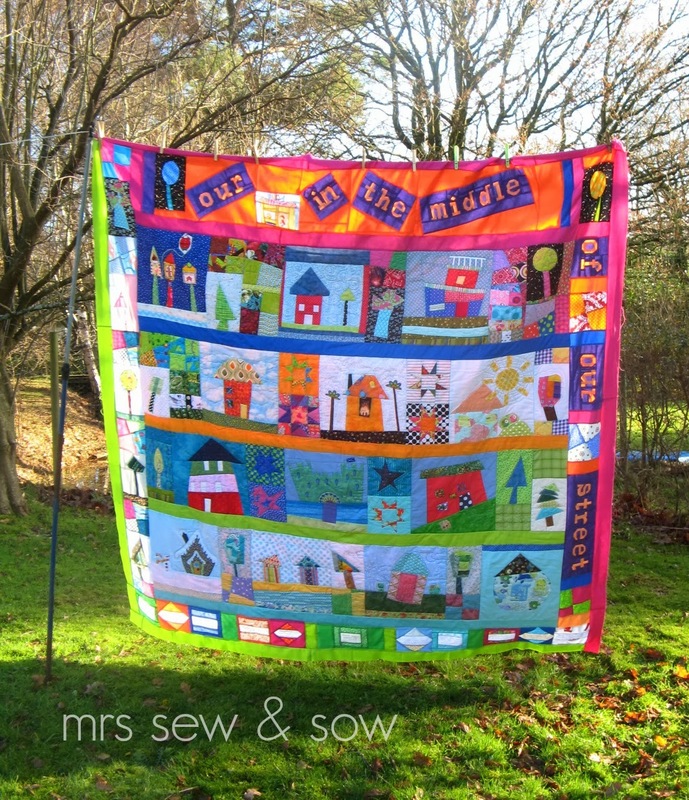 I have now stitched along my rows of big prints and gorgeous Oakshott and I have decided it needs to be bigger. Fortunately I seem to have been drawn to quite a few large prints and have some to spare from other projects so no shortage of choice! Just shortage of space on this piece of wadding. 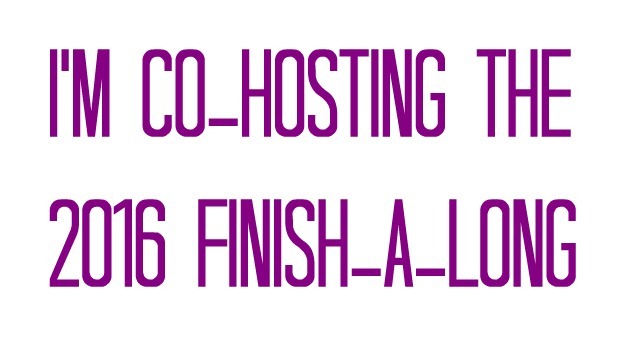 Here it is so far! I'm thinking it needs to be twice this size at least! 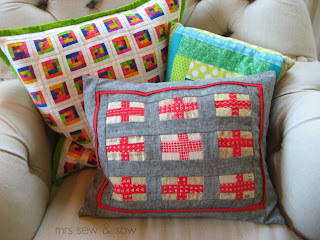 Fortunately the pieces are big and it stitches up quickly! 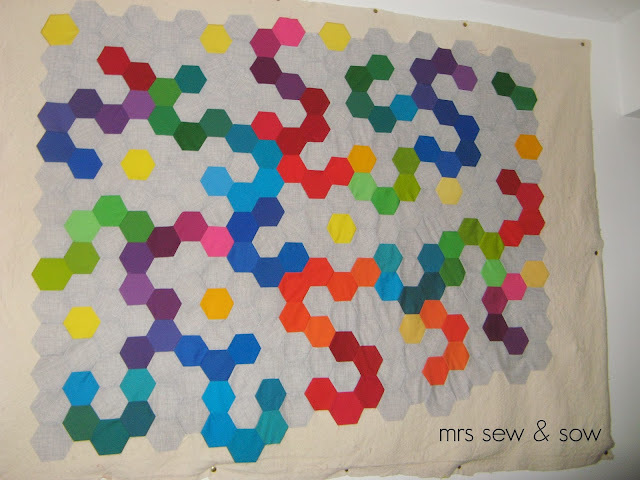 Now alongside this I am continuing with the hexalong revival. Helen helped nudge me in the right direction and comments seemed favourable - all except one questioning one from Alison! I was surprised - usually people say lovely things or don't say anything but Alison was brave enough to challenge the layout and use of white. 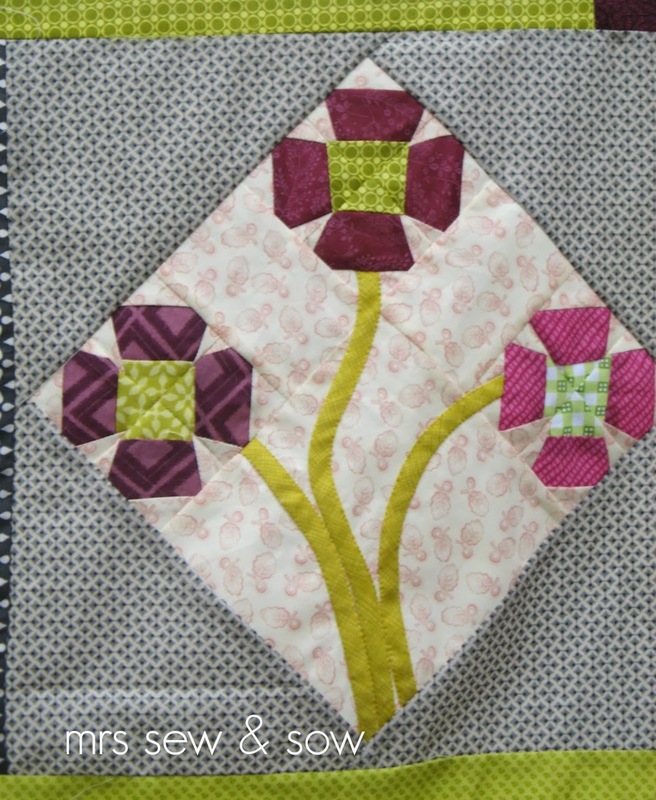 I have to say on reflection I knew it still wasn't cutting it for me and had decided to finish and pass it on. She was right my choice of white was wrong. I have to say it wasn't Helen's idea either it was just fabric I had to hand and as Alison put it a safe choice. I needed to think some more! 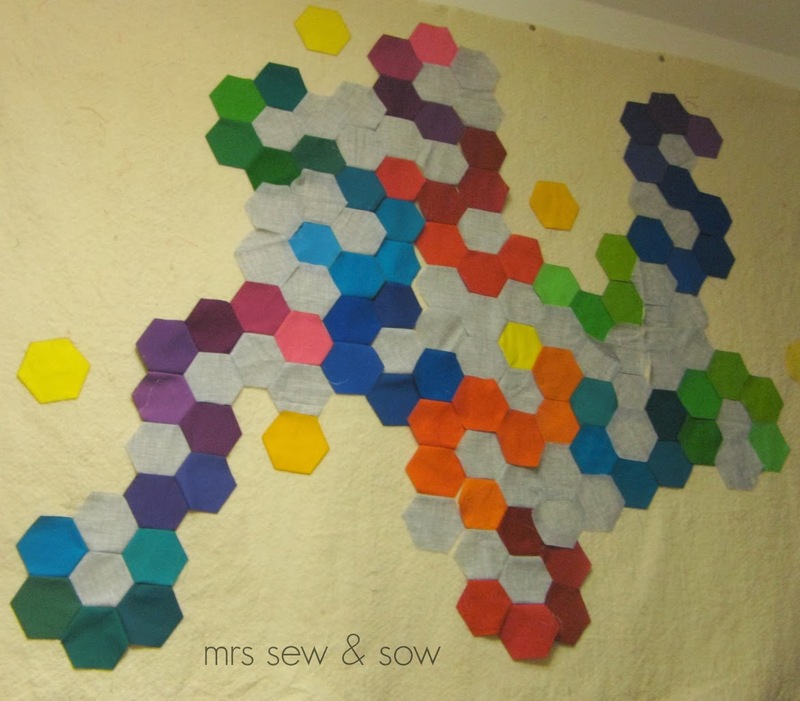 Enter influence from the other quilt - the Oakshott triangles on my other design wall were quickly inserted around a few of the hexies and just like that I knew this was the better way forward! but not the clinical look that it had with the white and regular layout! It looks like those Italian glass paperweights to me - those millefiori from Murano! And I love it! Might also be because of the extra green.... who knows! Thanks for the design help on this one from two lovely and helpful friends! Still got a bit to go before I can call this one finished but I'll enjoy the process so much more now as I can really look forward to the end result. 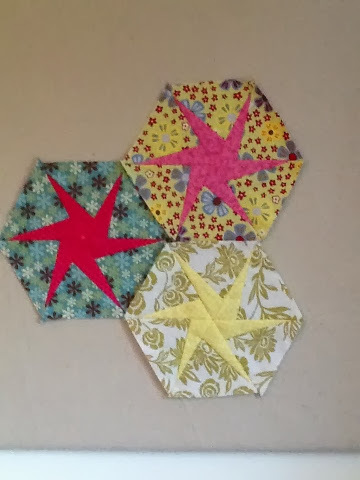 Just when I was about to get into the swing of making pieced hexies for my hexalong revival someone kept whispering a word in my ear - she might even have written the word several times in emails! The word was mycelium ! 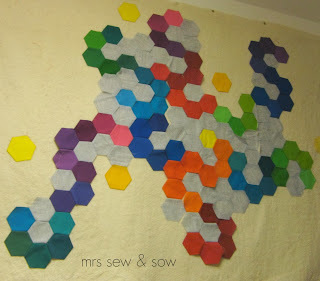 My totally pretentious title for a hexy concoction I put up on the design wall made with some Kona honeycomb pre-cuts and some Sketch which I sadly had to cut into hexies myself! 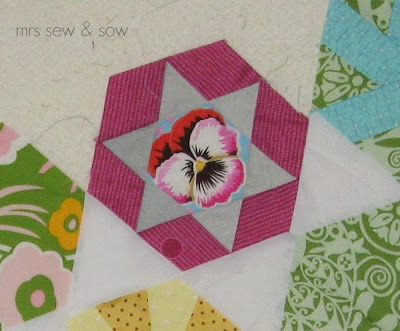 The reason it has sat there was firstly all those background hexies I had to cut out and also all those hexies I had to stitch together - not the most exciting piecing I have had to do! But if I'd known I could get most of it done in two days then I probably would have worked on it earlier - so thanks Helen for your persistence! 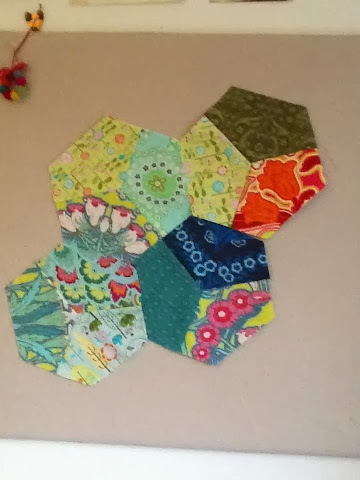 Only a hanging size and just a flimsy for now but I think I deserve a medal for cutting and piecing all those grey hexies! 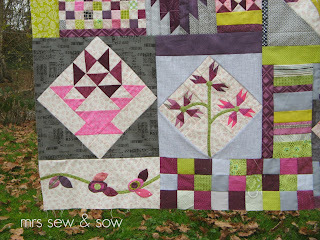 Modern quilting is not all a bunch of fun you know - sometimes you have to suffer for your art! 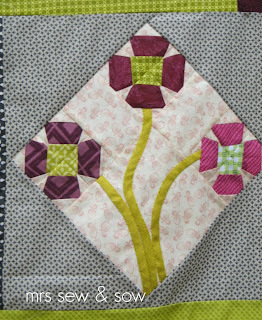 Now of course she is talking of quilting and a knife edge finish as perversely I'm wanting to keep that uneven edge! 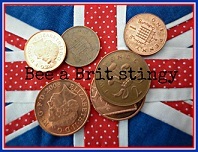 Dear Helen is full of fabulous information but suggests things as if they are easy for everyone! 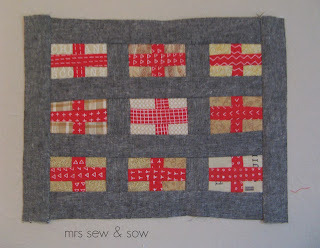 Oh dear....just as well I'm working on other things! I joined Lynne's Hexalong whenever that was! So now that the new one has become an old one and is on my UFO list I have decided to tackle it again! I went off it but thanks to my lovely helper Helen I can see a way forward with it. 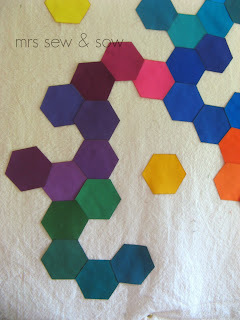 This layout gives the hexies more room to breathe....it also helps them to gel together. This is one of the latest additions - Helen tells me it's a Texas stars! There should be more coming soon. 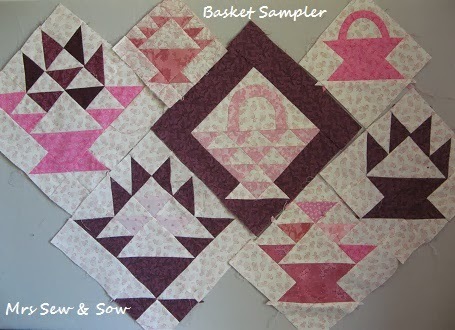 Cannot quite remember when I started my basket sampler but I do remember that I soon fell out of love with it - if I ever were! 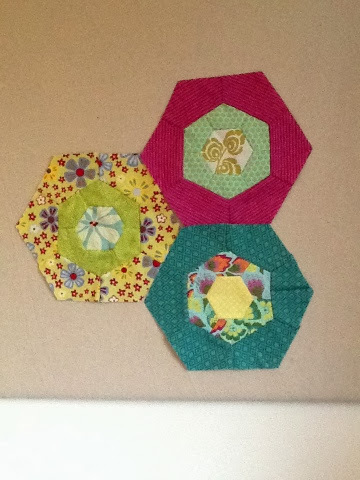 I only managed to complete 7 baskets though I had collected patterns for about 42 different variations on the theme! Too bloomin' PINK for my taste. A while ago in an attempt to calm that pinkness I added some yummy grey even some text fabric in the hope I could resurrect this UFO. But sadly though it looked better to my eye I still did not like it. Well inspiration comes at odd times and it is truly our job to listen. I thought what if I add another colour?? I was thinking ORANGE! But soon realised that would not work so got out my favourite colour GREEN! 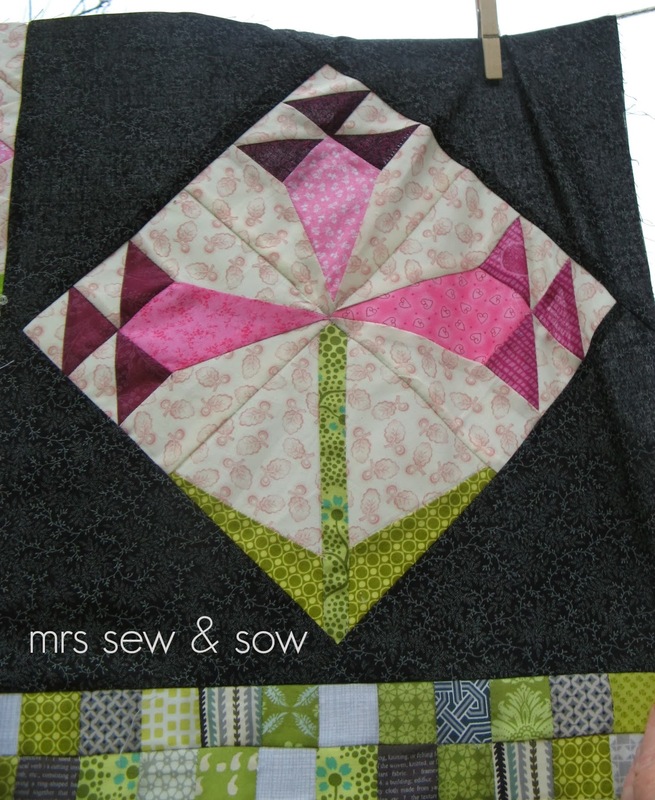 Ok not that green but a lime green! 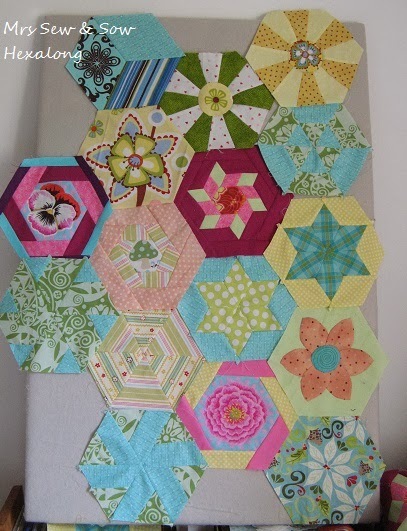 I started out with a bit of a border or two! Maybe channeling those medallion quilts that are around at the moment. I did wonder if I would be creating a multi medallion quilt. 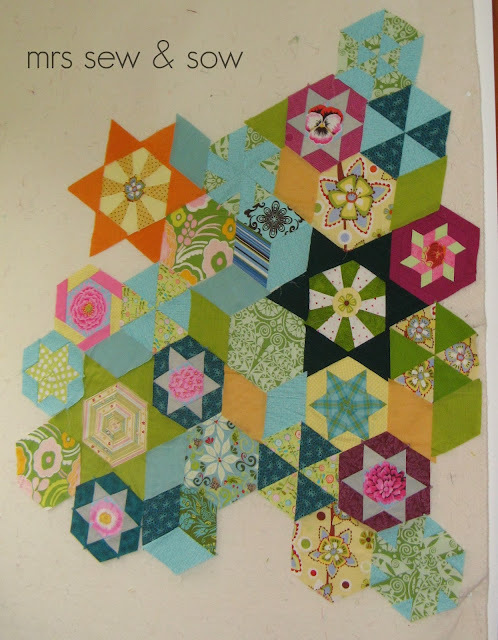 Next inspiration came from the gorgeous Green Tea and Sweet Beans quilt by Jen Kingwell - I needed other blocks as well as borders! 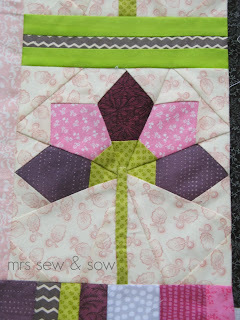 I made a few applique flower blocks using Jen's pattern and varied it a bit. And added a couple of pieced flower blocks from Suzuko Koseki's book Playful Patchwork - the Trumpet Vine and Batchelor's Buttons! 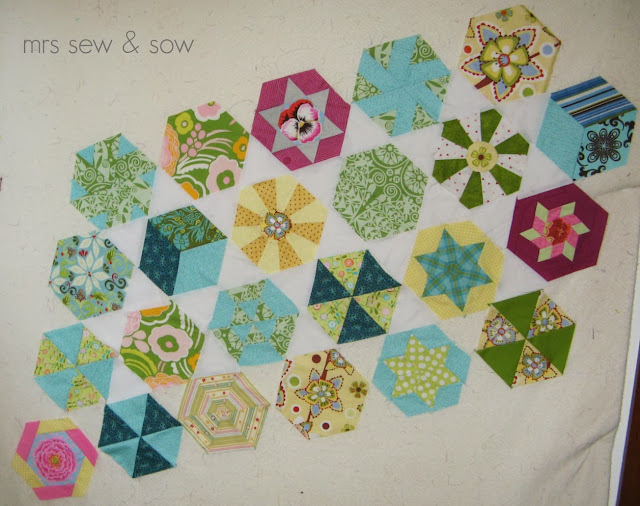 And more blocks from Lynne and Kerry's book 500 quilt blocks! I even adapted a couple to make them into flower blocks. I am so thrilled how a project I had no love for has now been transformed into one I adore! 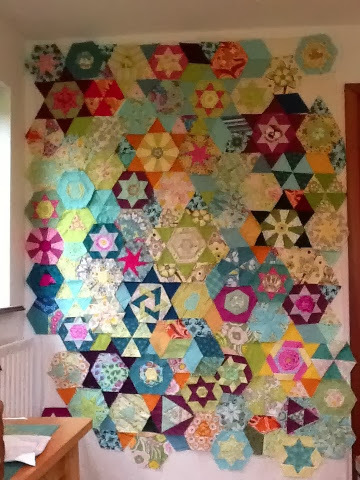 Here is it - sadly not a great day for taking photos but believe me it is a million times better than the quilt it was going to be!